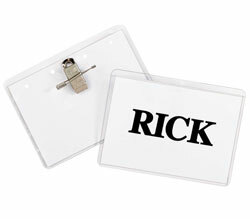 Take it up a level by adding a logo to your badge when you create impressive name badges instantly using your laser printer. Blue border. Compatible with all industry standard label software and comes on 8 1/2 x 11 sheets. Built-in templates in Microsoft Word and Corel WordPerfect. Pressure sensitive badges should not be applied to vinyl, leather, suede, corduroy or silk. 3 3/8 x 2 1/3. 200/BX.